March 2-3, 2019 on the Univ of Arizona Campus Mall. Be sure to stop by the “Adult Nonfiction Pavilion” for a visit. 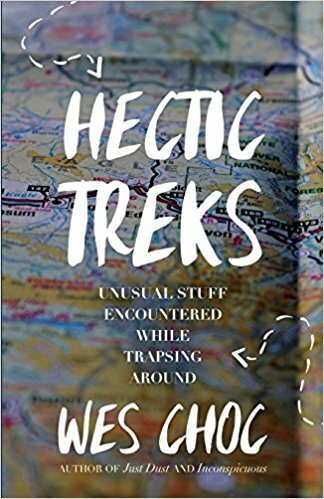 Mention this notification and website, and I’ll give you a free copy of my latest book “Hectic Treks” …several interesting tales about some unusual stuff encountered while traipsing around. I’ll be at the Nonfiction Pavilion only from 12-2:30pm Sunday, March 3rd. Besides visiting the Nonfiction Pavilion, this special event is worth spending some time along with thousands of others. It’s a one-of-a-kind kind of event, it’s lots of fun, and you’re likely to meet someone you know walking in the opposite direction. If you can’t make it, look me up on Amazon.com http://weschoc.com/hectic-treks/ and/or browse around my website for more information. It’s a coll ection of one-of-a-kind stories about some very odd things that happen when one travels around. Sure, there are some fantastic and magnificent places in the world …and these indeed get photographed every time …but the stories in Hectic Treks are about what goes on before or afterwards or in between …and not just touristy stuff. To tourist? …or to travel? To merely take photographs? …or to experience? It’s not about seeing the pyramids in Egypt …it’s about what happens if you break your arm descending the Alabaster Steps in Alexandria. It’s not about sightseeing the Alaska wilderness …it’s about what to do when you get a flat tire when it’s pouring rain, hundreds of miles from anywhere, with no cell service …and you can’t figure out how to get the spare off the bottom of that rented Ford Explorer. It’s not about celebrating Easter in that small village in central Mexico …it’s about what to do when you’ve lost your passports, AND your travelers’ checks, AND your airline tickets (just ask Carlos …he’s Maria, the Hairdresser’s husband). And what if you’ve just finished taking in all that Machu Picchu (Peru) has to offer and board the train to go back to Cuzco …then, once departed the station, that trainworkers are going on strike and the trip back will not be completed …it’s okay, we’ll make a stop in Urubamba so you can get off the train. Dozens of Tucson authors will be participating at a special book signing event on Saturday, November 18th at Mostly Books, 6208 East Speedway (at Wilmot) in Tucson. From 1pm to 3pm, Wes Choc will be presenting two books… his historical personal narrative titled “Just Dust, An Improbable Marine’s Vietnam Story” and “Inconspicuous, Wally Rothwell’s Undercover Journey During the Cold War”, a biography of a little known but historically consequential spy who retired to Tucson in the 1980s. This is a great opportunity to meet some local authors who will give you many further insights into their works …as well as signing your copy as a special remembrance. This is a fairly fast but intriguing read …especially in an e-book format like Kindle. “Inconspicuous” in its Kindle version has become a popular option. But the story is compelling all on its own. Be sure to go to https://www.amazon.com/Inconspicuous-Walter-Rothwells-Undercover-Journey/dp/0996417923/ref=sr_1_1?ie=UTF8&qid=1469039897&sr=8-1&keywords=wes+choc https://www.amazon.com/Inconspicuous-Walter-Rothwells-Undercover-Journey/dp/0996417923/ref=sr_1_1?ie=UTF8&qid=1469039897&sr=8-1&keywords=wes+choc for more information. Wally Rothwell was certainly an under-appreciated and practically unknown espionage agent … and yet he ended up being a quite consequential in the history books. There are no other biographies of this interesting Cold War player. Find out why. Now that Tucson hosts the 3rd largest book festival in the country, it has become quite an event to see …to wander around …and to participate in for tens upon tens of thousands of folks from all over. Sunday afternoon (March 12th), I was able to gain a spot in the Nonfiction Author’s pavilion. Be sure to stop by and say hello if you’re in the area. Most of all, come visit the festival and take it all in. t’s time well spent. Save time and money when you get the Kindle version. Take a look at Amazon’s presentation at Amazon.com and get your own copy! I apologize to all my loyal readers and posters for this site being down for over a week as we completed a transfer to a new host. I appreciate your understanding and continued loyalty. And, thanks for your considerations as well.